The time, mid-morning, the date, Christmas Eve 1968 – the location space. “As the spacecraft Apollo 8 emerged from the far side on its fourth orbit (around the Moon) crew commander Frank Borman rolled the spacecraft so as to position its antennas for radio contact with mission control. Looking to the lunar horizon for reference he exclaimed – “Oh my God, look at that picture over there! Here’s the Earth coming up!”…. This was the first time any human being had ever seen the earth objectively, seen it as a glorious heavenly body. Suddenly we knew that “planet earth was blue” and songs were sung about it. 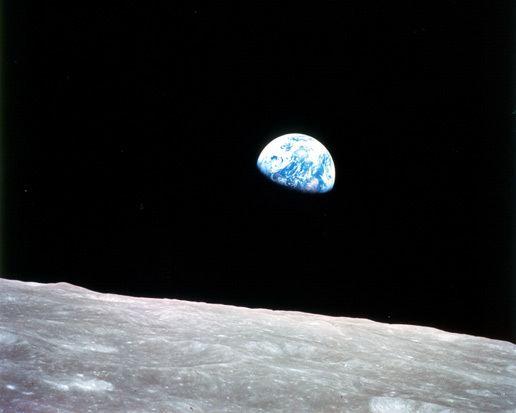 The spectacular images that were sent back to earth, and viewed on Christmas Day were called the “earth rising” photographs. As you can see the earth is in the sign Cancer. Cancer is the sign of the nurturer, of the breasts, of universal motherhood. It is a water sign – and water is one of the essential elements of life. Earth has always been known as ‘mother earth”. In myths the earth is always seen as fertile, protective and unpredictable. The Earth is Gaia – she. The heavens are Uranus – he. Interesting too then that the Earth is in a close square aspect with the planet Uranus. This is its only contact. It is as if the whole of the earth’s tempestous, violent history as a planet is summed up in this single aspect. The window of opportunity for a planet to be able to sustain life is so small, it is such an achievement, that it makes our planet at once totally unique but also impresses us with it’s total vulnerability. Many writers since then have said that the whole ecology movement began after we first saw our own planet. It is as if we needed this – at the time high-tech Uranian – wake up call. Like a baby recognising its mother’s face for the first time, our love for and interest in our home planet was suddenly awakened. 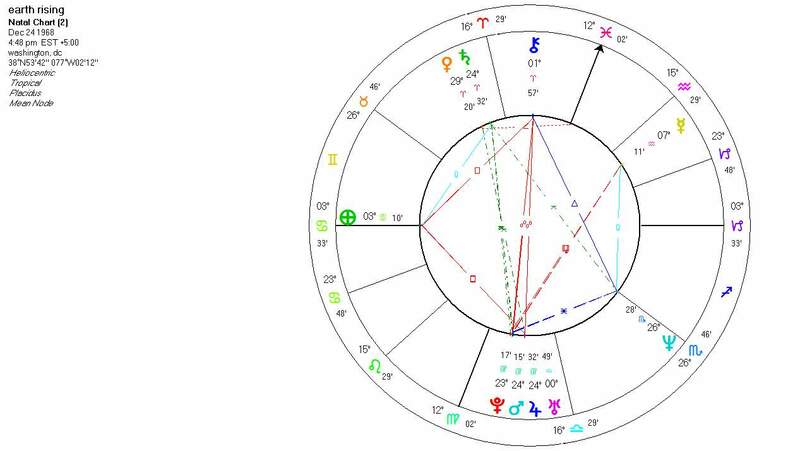 The heliocentric chart shows a multiple conjunction of Mars, Pluto and Jupiter in the earth sign Virgo, sextile a watery Neptune in Scorpio. All four planets are then inconjunct Venus conjunct Saturn in the firey Aries. What we have here off course is a Yod. The focal planets point to the major challenge for earth bound souls. Venus/Saturn = bounded love. Mercury stands alone in Aquarius loosely linked by trine to Uranus – which is viewed by some astrologers as a higher octave of Mercury itself. This is the intelligence, the ratio with which we have been blessed (or cursed depending on how you view it). Blue is the colour of Mercury, is the colour of intelligence. The cool blue of clarity, of a lagoon, of the sky on a summer’s day, of the sparkling clear sea. Clear as a thought untinged by emotion. Earth is where the cosmos pauses, and where God is able pause in order to winess his creation. 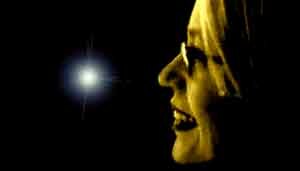 Dit bericht is geplaatst in Astrology English, Elizabeth Hathway DFAstrolS, mundane astrologie en getagdDFAstrolS, Earth rising, Earth rising the horoscope, elizabeth hathway, the horoscope. Bookmark de permalink. Ik kan me goed voorstellen, dat toen de milieubeweging is begonnen. Het is het moment van toenemend groter bewustzijn. Vroeger identificeerde je je slechts met je eigen dorp, later bij het ontstaan van de natie-staat met je eigen land (“wij zijn Oranje”) en deze foto is voor mij het eerste teken van een ontluikend planetair bewustzijn, dat weet dat heel de aarde met al zijn bewoners één geheel is.